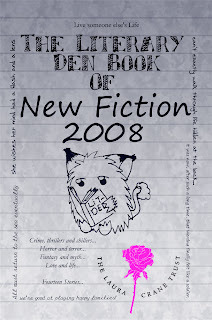 The Literary Den Book of New Fiction 2008 is the first book ever that I'm in. I was very excited when Claire Hack (AKA The Rainbow Powered Rocket Rabbit) suggested the idea on our forum! A Literary Den book! After only 6 months the group were planning a large project like no other any of us had ever seen. That is, no one but Samantha Priestley. She was introduced to us by Chris Stewart when her first book, Despite Losing it on Finkle Street, went on sale. So with one published author, a whole bunch of hopefuls, a marketing expert and a very keen editor! As a group, our first task was to get a name. Many were suggested and shot down in an instant, but finally we ended up with our final title. Then it was Claire Hack's job, after she made a first version, to make a cover for the book. The charity was pretty easy for us to agree on. Andy Walker, our final editor, suggested it at the start. We all knew in our hearts it was the best way to go. A charity that helped people our age was a message we liked. After so much hard work put in by us, we want to know it'll be put to good use. The Laura Crane Trust is the only UK and Ireland based charity that fund research into cancers affecting young people between the ages of 13 and 25. Based in Huddersfield, Yorkshire, the charity was founded by Jacquie Roeder, Laura's mother after the latter's untimely death only two weeks after her seventeenth birthday. As cancer in young people can be extremely damaging to their health and their esteem, the LCT aims to improve their lives during treatment as well as funding methods to battling cancer. Cancer in young people spreads and grows quicker than in other age groups because teenagers are going through growth spurts. This makes cases of cancer much worse for them, despite cases of cancer in this age group being rarer. After months of hard work, the Literary Den had released their book to help the LCT. The battle against cancer just got one more ally. Help us prove that The Pen is Mightier Than the Sword. Lit Den Book - Here! !